The story of the evolution of business in this country is in many ways the story of the evolution of the automotive industry. The shift from an agrarian to an industrial society, the growth of the middle class, and much of the world's cultural development in the past hundred years has been driven by the automobile. And all the challenges facing global industry today- re-engineering, achieving customer focus, cycle-time leadership, becoming market-driven, dealing with overcapacity, regulation, consumerism, and environmentalism- are nowhere more vital than in the world's auto industry. The story of the automobile industry is largely the story of economic, societal, business and marketing history in our times. The story of the American automaker, particularly the "Big Three" of General Motors, Ford and Chrysler between 1890 and the 1970s, is the ultimate case study of business development in a manufacturing-driven, growth environment. The last 20 years, however, have brought a very different scenario to world business. This period of intense global competition has seen a paradigm shift in priority to a market-driven customer focus. Understanding this change and predicting its future is a complex process. It requires a balanced understanding of a number of areas- automotive history, economics, the evolution of the Dealer distribution system, and cultural-social evolution. And it demands an understanding of the rapidly developing strategies that must realign all industry to an intensively competitive international marketplace, clearly driven by customer requirements. ...Every Purse and Purpose, named after Alfred P. Sloan's description of the first "reengineered" General Motors in the 1920s, addresses the history of the automotive business and all the factors that have impacted it. 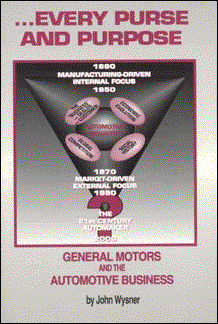 It focuses on GM's rise to industry and world dominance through the "cradle to grave" strategy. Through a decade-by-decade analysis, it traces the company's dramatic success. It also documents its fall following its second major reengineering during the 1980s largely due to a failure to recognize the emergence of the empowerment of the customer. Then, the industry's strategic comeback in the early '90s is analyzed. Finally, the book provides a detailed prescription for positioning GM to recapture world leadership in the 21st century, based on a return to its roots in product alignment combined with leadership in total customer service. Global economic power in the next century will come from the culture, trade alliances and business strategy that produces the world's dominant automaker. Every Purse and Purpose projects the likely course of this battle based on an in-depth understanding of automotive business history, the evolution of strategy in the business and the cultural development of the competing nations. Author John Wysner has worked closely with the top executives in the American automobile industry for the past twenty-nine years. He served as a principal consultant to General Motors Corporate Staff and vehicle marketing divisions on a number of standards-based management, business planning, and customer satisfaction systems. He designed and managed Chevrolet's in-dealership Service training, and set up management systems for GMC Truck, GM of Canada, Oldsmobile, and Chevrolet. John Wysner is the President of The High Performance Group, Inc., a Southfield, Michigan firm. He is a member of the American Management Association, American Society for Training and Development, Society for Technical Communications, and is a winner of several National Awards for Service Training for General Motors. He is the author of Rays of Hope and Anatomy of a System, books on the Auto Industry. He is a Gold Leaf contributor to National 4-H Council, one of the country's largest youth development organizations, and a Strategic Planning Consultant to 4-H. John Wysner is listed in Marquis' Who's Who and in the U.S. Registry's Leading American Executives.